Breast cancer metastasis, a fatal complication of the disease, does not fully benefit from available therapies. The identification of new molecular markers that may predict the risk of metastasis progression is of invaluable help for the follow-up of the patients and choice of therapeutic options. Our study shows for the first time that ATIP3 is a prognostic marker for overall survival among patients with metastatic breast cancer, and identifies a population of patients at high risk of developing distant metastasis. We also show that ATIP3 is a new anti-metastatic molecule. Its re-expression in breast cancer cells delays the time-course of metastatic progression in vivo and limits the number and size of metastatic foci. In vitro, ATIP3 expression impairs cell migration and directionality through regulation of microtubule dynamics. This leads to a significant reduction in cancer cell invasion, extravasation and colonization, which are the essential steps of cancer metastasis. 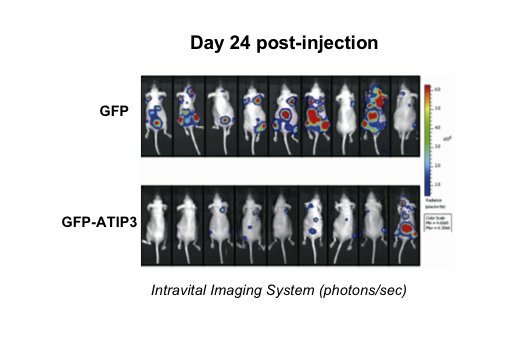 This study is a major step toward the development of new targeted treatments against a population of metastatic breast tumors that have lost ATIP3 expression. - Molina A, Velot L, Ghouinem L, Abdelkarim M, Bouchet BP, Luissint A-C, Bouhlel I, Morel M, Sapharikas E, Di Tommaso A, Honoré S, Braguer D, Gruel N, Vincent-Salomon A, Delattre O, Sigal-Zafrani B, André F, Terris B, Akhmanova A, Di Benedetto M, Nahmias C*, Rodrigues-Ferreira S*. [*Equal contribution]. ATIP3, a novel prognostic marker of breast cancer patient survival, limits cancer cell migration and slows metastatic progression by regulating microtubule dynamics. Cancer Research 73(9):2905-15 (2013).